your PayPal account has exceeded this set limit in total transactions. https://www.psi.gov.sg/NASApp/tmf/TMFServlet to print out your document. enable your documents to be routed and handled in a timely manner. link at http://www.paypal-apac.com/sg/kyc/faq for more details. or email us at compliance-apac@paypal.com. What you have to do now is to prepare the documents needed (which is your Valid Photo ID & Proof of business registrations) in jpg format. A copy government issued Identification Card of the account owner such as NRIC, Driving Licence or Passport (Note: Name on ID must match PayPal account). Scan it and save as jpg format. Buy your business profile from Bizfile for S$5, press ‘alt’ ‘print screen’ to copy the 1st page of the business profile and paste it into your favourite graphic editor and save as jpg format. 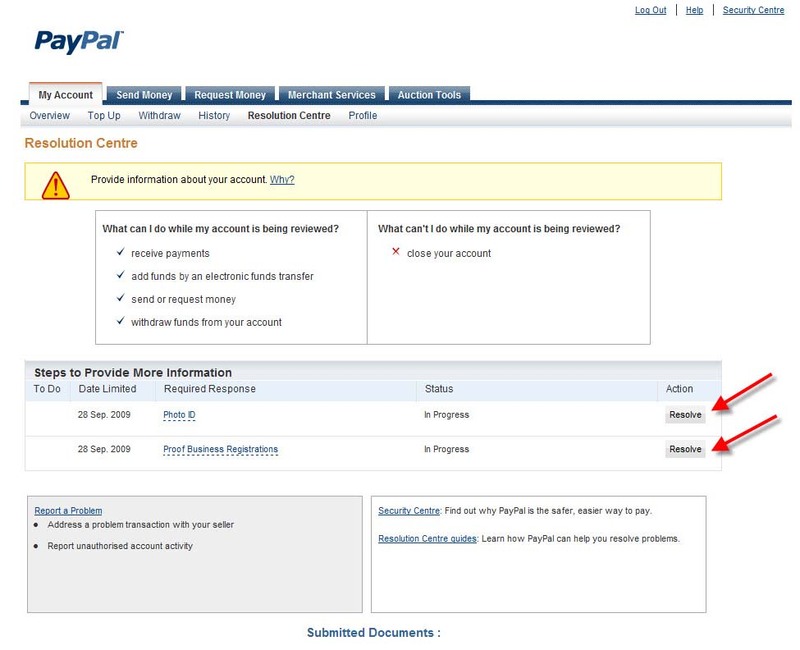 Click on the ‘Resolve’ button to upload the required documents and wait for email from paypal.